Campus Admin Ignored Students’ Demands for Black Visibility. So They Took Over Their Building. The Afrikan/Black Student Alliance of the University of California, Santa Cruz, camped out for three days until the school met its demands. Hundreds gathered at the University of California Santa Cruz’s administration building on the afternoon of May 4, quiet with anticipation. While some waited at the entrance, many others stood on the roof. The crowd began to stir when someone spotted a group of students half-jogging from the hill, trailed by a few administrators. 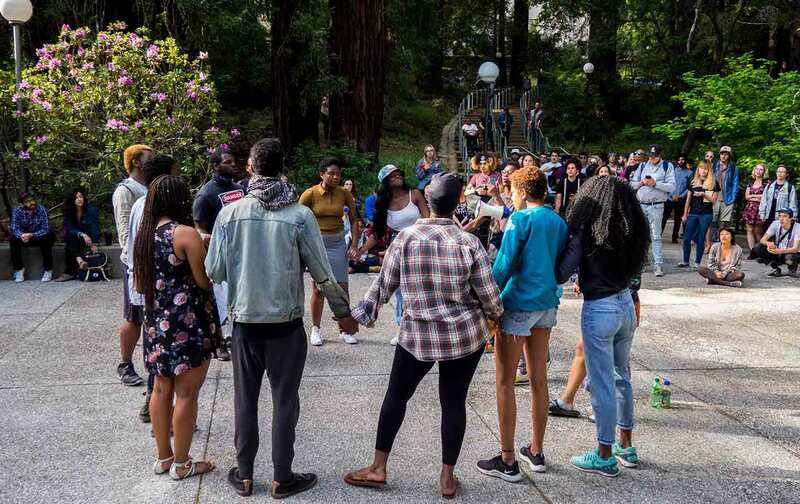 As Imari Reynolds, fourth-year student and chair of UCSC’s Afrikan/Black Student Alliance (A/BSA), reached the building, she clicked on the megaphone and tilted it up to the crowd of nearly 300. The other administrators hung back as the news and media-relations director stepped forward. Uncomfortably fiddling with the megaphone, he read from a written statement as hundreds of students watched. “We recognize that we have more work to do in supporting Afrikan Black Caribbean (ABC) identified students at UCSC,” he read. “We are committed to build capacity to fully integrate ABC-identified students so that they have a sense of belonging and connectedness here on campus.” He proceeded to list the students’ four demands and then agree to each, one by one. These would be met, he said, by fall, 2017. It was the verdict they had been waiting for after three days in the administration building, which the crowd of hundreds had refused to leave until their demands had been addressed. As the good news reached the students, they broke into a collective cheer, chanting “A/BSA” and “Black Lives Matter,” before falling to a hush as one A/BSA member took the megaphone. On May 2, following a campus-wide march and after more than two years of rejected demands, members of A/BSA, joined by hundreds of other students, entered Clark Kerr Hall and demanded that the employees leave the building. They banged on walls and knocked on doors. At first, some stayed, ignoring the students or putting on headphones. Others grew angry, making snide or hostile remarks as they left. The building eventually emptied, and over the course of three days 150 students set up camp across the four floors of the building. Some slept on the ground; others stayed only during the day. Door alarms went off every so often, signaling that they had been open too long. Students plastered the windows with black and red paper signs and piled chairs high around entryways. In a statement, A/BSA students wrote that what they were doing was not an occupation: It was a reclamation. Occupations, they said, are associated with colonial violence and oppression; a reclamation refers to taking back resources that originally belonged to students. “We know that language does matter, as do intentions,” A/BSA wrote. Santa Cruz County is ranked as the fifth-most expensive metro area in the United States, according to the National Low Income Housing coalition. Students frequently live in garages, deal with annual increases in rent, or settle for substandard living conditions as rental prices soar. With the limited space, and the overflow of Silicon Valley workers into Santa Cruz, housing prices continue to increase with income levels. Making up to a $80,650 salary is considered low income in Santa Cruz, according to the Santa Cruz County planning department. That was before the reclamation. As night fell on the first day, students clustered in groups and took turns guarding the doors. While someone played Kendrick Lamar’s 2015 album To Pimp a Butterfly on their speakers, the usual campus announcements that light up the lobby television screen were replaced with a running slideshow flashing images of Rosa Parks, Huey P. Newton, and Malcolm X. The following day temperatures climbed to over 90 degrees in the poorly ventilated, airless central building. Students constructed a makeshift shower from blue tarps and a garden hose, passed around water bottles, and shed layers of clothing to fight the heat. Some would later use the clothing for face masks: Because UCSC is a public school, being in Kerr Hall after 5 pm is considered trespassing and grounds for arrest. With this in mind, many students wrote phone numbers of friends, family, and legal representation on their arms. However, no arrests were made, and no officers entered the building during the reclamation. “We support students exercising their First Amendment rights, but we do not endorse taking over buildings, which displaces university employees doing important work in support of the very students who entered the building,” Blumenthal wrote in an emailed statement. The reclamation itself was the result of six weeks of meetings and logistical planning. The plan was to begin with a march across campus, which A/BSA members were prepared to do alone, if necessary. But hundreds of other students across campus joined them in marching and taking the administration building. By day three, Blumenthal agreed to meet with representatives from A/BSA but declined to meet them at Kerr Hall, citing safety concerns. He instead requested A/BSA leaders meet him at another campus location, and if not, suggested they speak to his secretary about setting up a meeting over the phone. “Could it be that George is afraid of the very students he represents?” A/BSA chair Reynolds had asked the crowd before leaving to speak with him. She had followed this by asking how many students in the crowd had ever seen the chancellor in person. Less than half of the crowd raised their hands. In the wake of their success, students cleaned Kerr Hall, removing the door blockades and donated leftover food and blankets to community members and to local nonprofits aiding the current water crisis in Flint, Michigan. There was no damage to the building or university property, and Kerr Hall has returned to its normal daily operations. A/BSA also received notice that the university would not pursue disciplinary or criminal action. The administration promises to meet their demands by the fall quarter, and the housing administration said that plans to fulfill them are “already underway.” A/BSA members say they’ll believe it when they see it. “We don’t want to accept anything off of a white man’s promise,” Means said, summarizing points made by A/BSA advisor Tommi D. Hayes in the meeting with Blumenthal. Not only that, A/BSA has two more demands that have not been met, one calling for the creation of a co-op off-campus for low-income and underrepresented students and the other for the allocation of $100,000 toward the hiring of a Black advisor in SOAR/Student Media/Cultural Arts and Diversity (SOMeCA)—an office that supports A/BSA and other campus-wide student organizations. Reynolds said that they will revisit the final two demands once they see that the others are in place. “The implementation is one of those things to work out now,” said UCSC’s News and Media Relations Director Scott Hernandez-Jason. “We are committed to it because we know we can do it, but step one is getting to this point.” The majority of the demands are scheduled to be complete by the beginning of next year. Though the mandatory online diversity training will not be completed until the following year, in fall 2018, UCSC will require incoming fall 2017 freshmen to complete in-person diversity competency training until the online module can be established. Georgia JohnsonGeorgia Johnson is a student at the University of California Santa Cruz and co-editor-in-chief of its student paper, City On a Hill Press.